I have been a galactic Star Wars fan since my dad dragged me to see the original film in Ventura a (somewhat) long long time ago. I remember going into that theatre being very scared and coming out being changed forever. I worked at Lucasfilm for seven years and was even a visual effects artist for a bit. 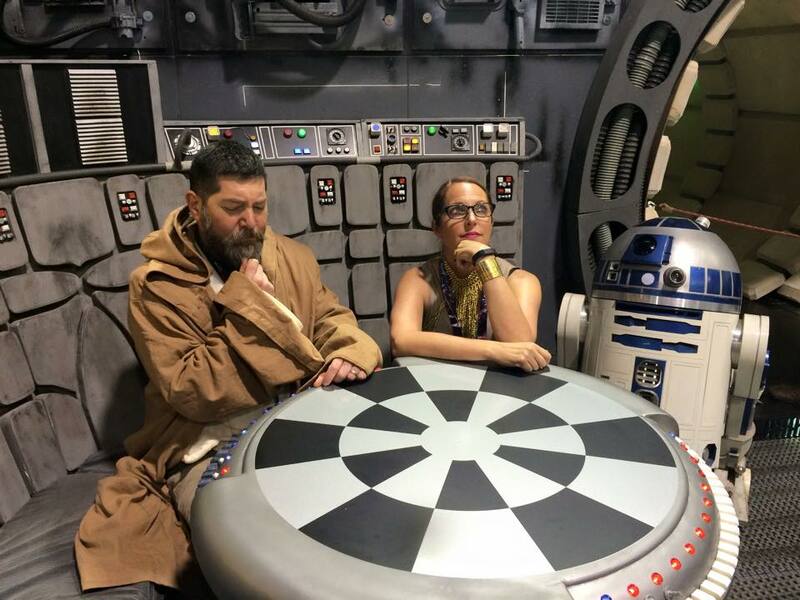 Most of my friends think I’m crazy to still be such a die-hard fan but going to the Star Wars Convention continues to awaken the Force within me. Get teary-eyed I do when I hear the Star Wars theme song. I couldn’t wait to be among my people; it’s the only place I feel safe talking about my Star Wars bed sheets as a grown woman with no kids. So let’s grab some Wookie cookies and do this! The best part for me is the people watching. 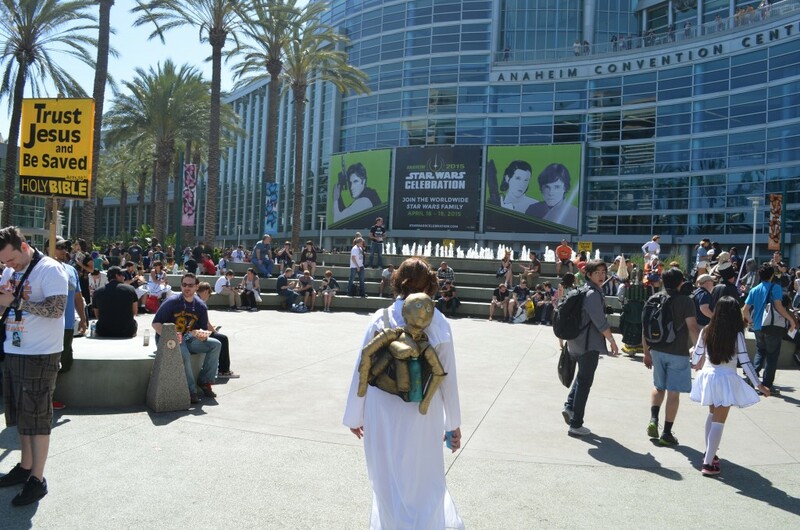 I love the cosplay and seeing how creative these Jedis get with their costumes. 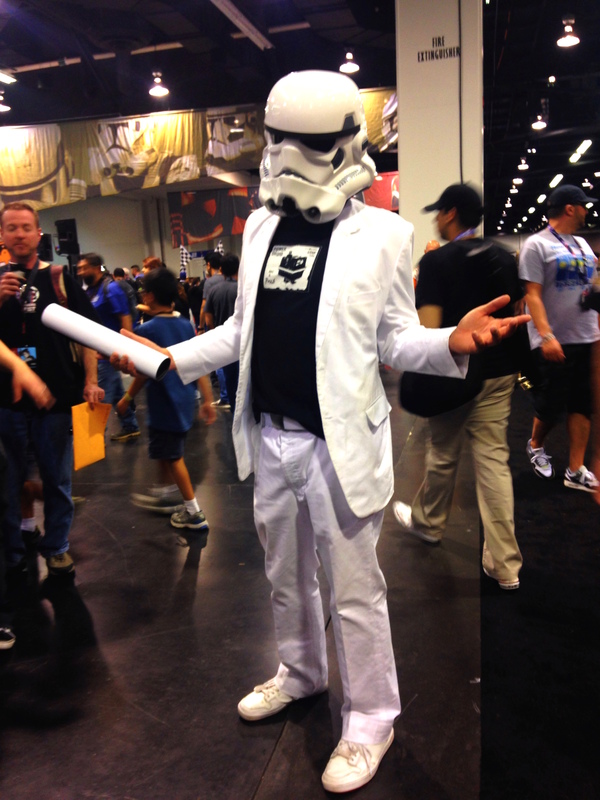 Star Wars fans like to go into great depth discussing how they made their outfits, and they take it very seriously. This X-wing Fighter’s BB-8 ball droid was most impressive. I ran into some friends that still work at Lucasfilm and it’s always a family reunion when we see each other. I was meandering the autograph hall and found my friend Lorne Peterson signing autographs. 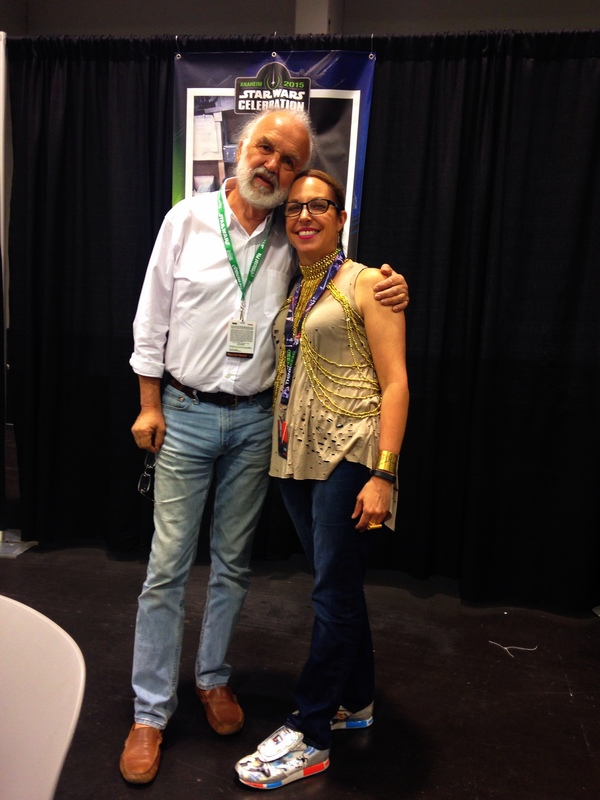 Lorne is an Academy award winning Creature/Modelmaker and worked on all of the Star Wars films. He’s an all around awesome dude! CF?? UR DEAD TO ME. Here’s Ashley Eckstein, the voice of Ahsoka Tano in The Clone Wars and a genuinely nice person to know. Ashley created her own line of geek girl wear called Her Universe. It’s great because at most Cons it’s usually men-sized shwag and now that more chicks are coming out as nerdy there’s a bigger demand for cool gear to wear. 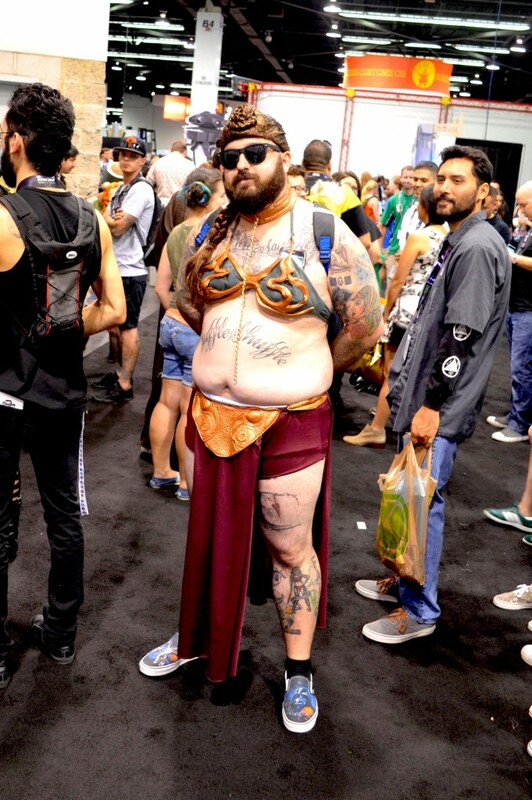 Her Universe has plus sizes to boot, because not every fangirl looks like Kristen Bell from Fanboys. 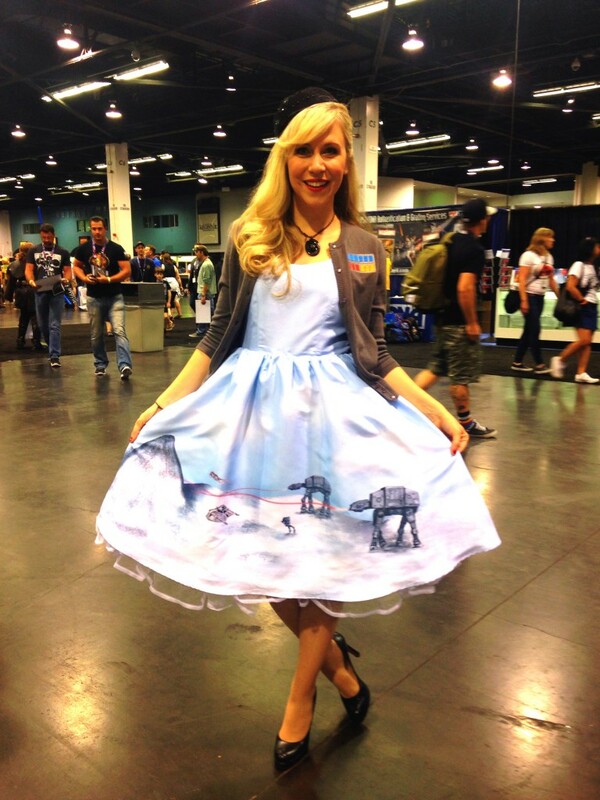 Notice Ashley’s swanky Hoth pin up dress? There were movie sets up around the convention of the Cantina, the Millenium Falcon, The Rancor and the speeders in Endor. Even though I’ve already been around most of the sets and props at Skywalker Ranch, it’s still exciting to wait in the long lines to get your picture taken. We watched the latest The Force Awakens trailer on our phones a few times and discussed it with others in line to pass the time. Ok it’s time to talk about the dudes. There are mostly guys at these conventions and I get checked out a lot and I LIKE IT! Especially when I dress up as slave or classic Leia. Guys still go nuts for that costume and honestly classic always wins because it’s subtle. The second best thing is that there is NO LINE IN THE LADIES’ RESTROOM! SNAP! This guy gave me his number, sweet! 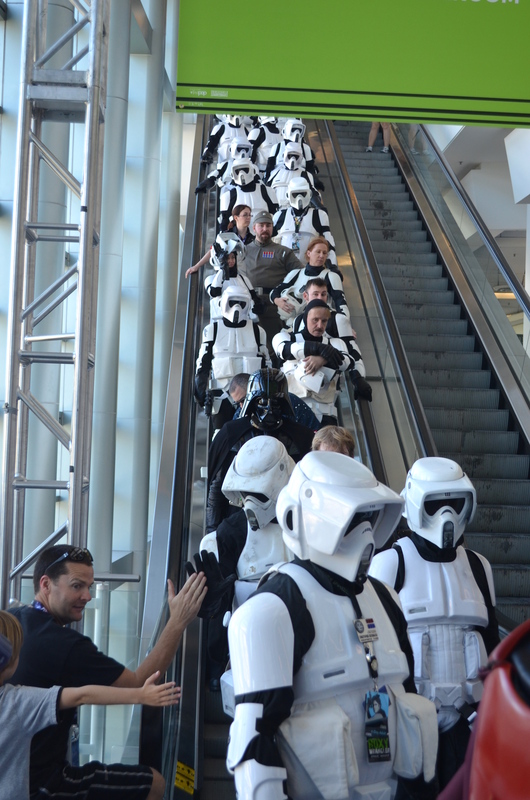 Hey lookie, they ride the escalators just like US! 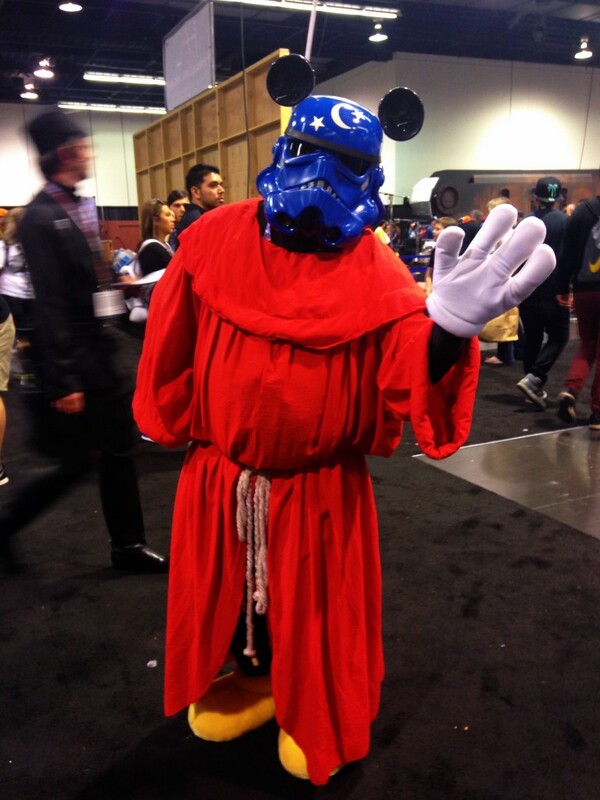 Darth Mickey?? Okay, just to get this out of the way, the whole Disney buying Lucasfilm thing, this Star Wars/Disney mashup is TOO SOON! It’s growing on me slowly but initially I think most of us ex-employees and fans were shocked. I mean for years the Star Wars legacy has kept going due to its fan base and trickled down through family generations. Now with Disney the franchise is going to explode like the Death Star and pretty soon we’ll have things like Star Wars on Ice. 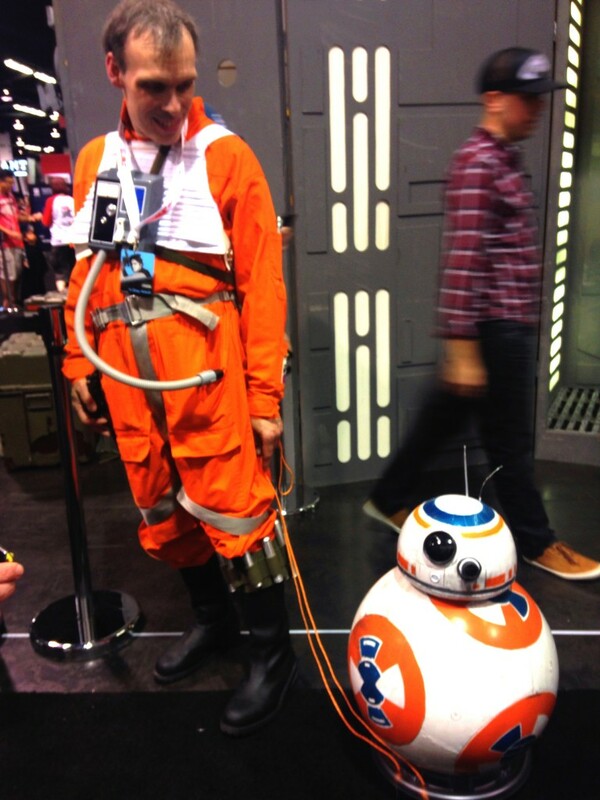 Everyone at the Star Wars Convention is so approachable for pictures or chatting about all things Star Wars. You have this instant community of friendship and bonding. It’s unique from the other Cons because you know everyone is into the same thing instead of wondering what everyone’s passion is at the other Cons. 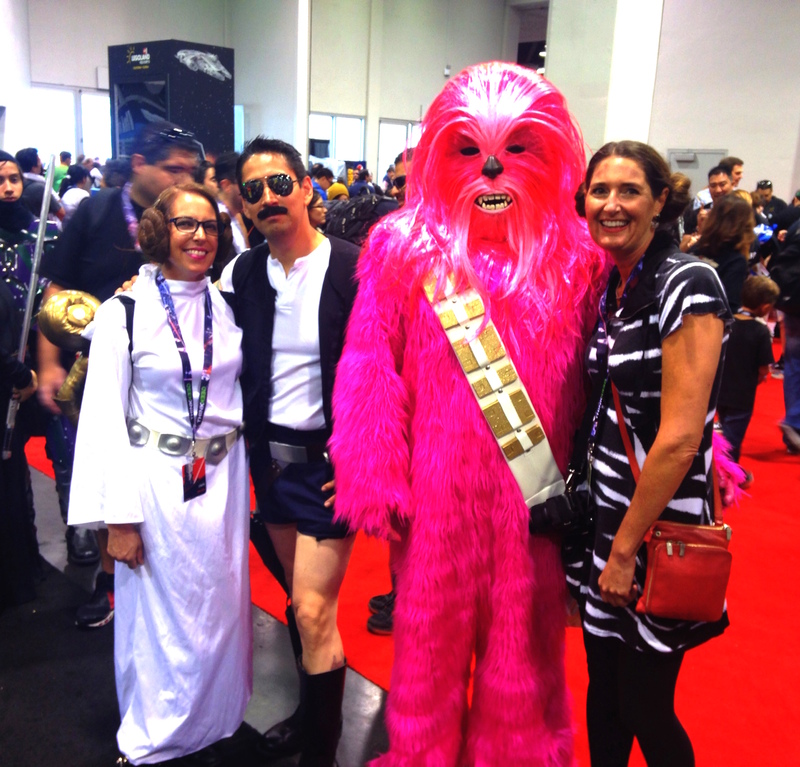 Village People Han Solo and Pinkbacca invited my friend Nancy and I to share some Tusken Raider taters afterwards. 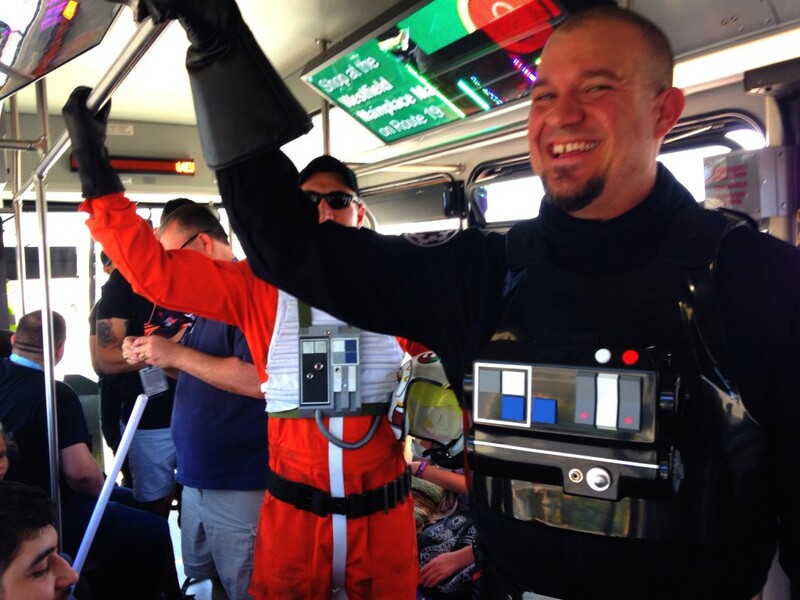 At the end of the last convention day, I rode the bus back to the parking lot with an X-wing and a Tie Fighter from Albuquerque, New Mexico. We talked about the convention, shared some pictures, complained about our sore feet. They were bummed they didn’t get Mark Hamill’s autograph and asked me if I met any of the cast members. 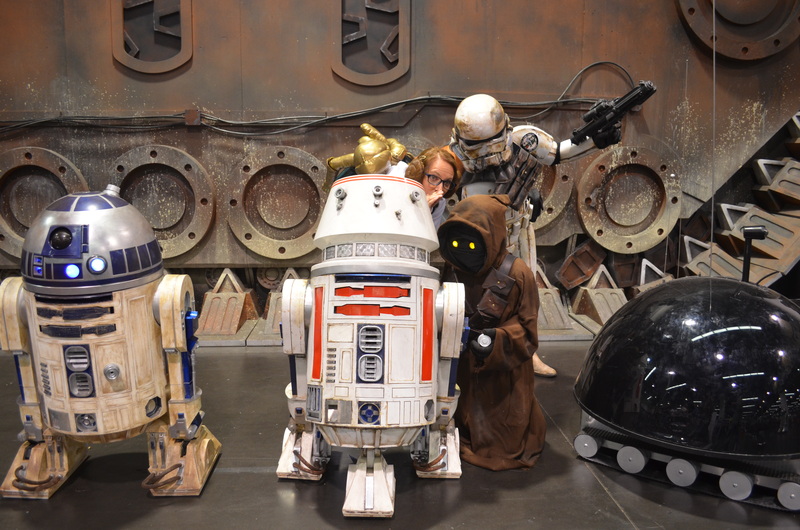 I told them I was a Lucas alumni and had met everyone from the original cast except for Kenny Baker. They had never met anyone that worked there and peppered me with questions. I never forget how lucky I was to be a part of such a great community of people and creativity at Lucasfilm. Speaking of creativity, looking forward to seeing more of this next time! Heyyyyy!! 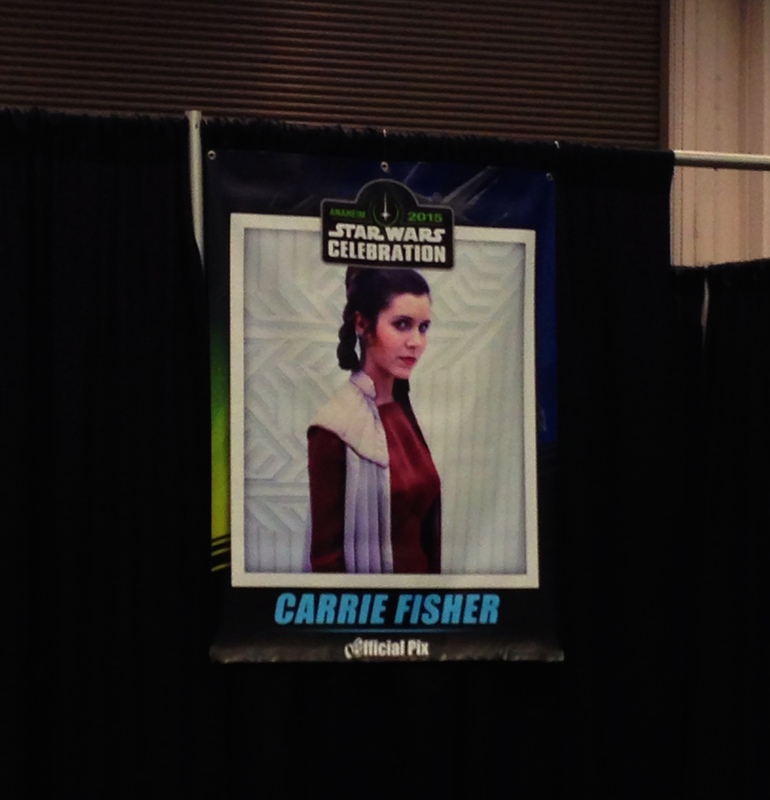 This entry was posted in Star Wars and tagged Carrie Fisher, Industrial Light + Magic, Lucasfilm, Star Wars Celebration by laurel. Bookmark the permalink.